Mills Reef Winery was established in 1989 by the Preston family. The jewel in the Mills Reef crown is their 17-hectare (40 acre) vineyard in the GIMBLETT GRAVELS WINE GROWING DISTRICT. 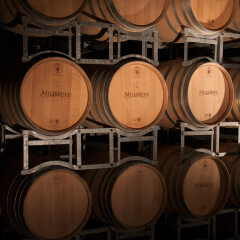 Through commitment and dedication to excellence, the Mills Reef brand has established itself as one of New Zealand’s premium labels with a particular reputation for outstanding Bordeaux varietal reds and Syrah. 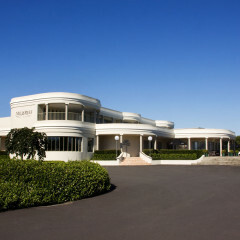 The winery has established itself as a major Tauranga landmark in the sunny Bay of Plenty and is located on 20 acres of beautifully landscaped grounds just minutes from Tauranga’s CBD. The complex boasts full winemaking and bottling facilities, two underground barrel cellars, an aged wine cellar, and spacious wine tasting areas. An award winning 150 seat restaurant completes the picture, providing a wonderful ambience for a-la-carte dining, weddings, functions and conferences, and an underground Barrel Room offering dinners and events hosting up to 300 seated or 500 cocktail. Mills Reef wines are produced from superior grapes grown in the Hawkes Bay region, they are hand crafted by their winemaking team in Tauranga, New Zealand, employing 100% sustainable practices throughout the winemaking process, from vine to glass. The wines are produced under three ranges, each with their own winemaking philosophy and stylistic bent – Mills Reef Estate, Mills Reef Reserve and the super-premium Mills Reef Elspeth. Contracts with proven Hawke’s Bay vineyards provide some of the annual 550 tonnes crush. The jewel in the Mills Reef crown is their 17-hectare (40 acre) vineyard in the “GIMBLETT GRAVELS WINE GROWING DISTRICT”. The Mills Reef super premium “Elspeth” range are a testament to this region. The GIMBLETT GRAVELS WINE GROWING DISTRICT is strictly determined by the gravely soils laid down by the old Ngaruroro River in Hawkes Bay, exposed after a huge flood in the 1870’s. The temperatures in the GIMBLETT GRAVELS WINE GROWING DISTRICT are between 2 and 3 degrees Celsius warmer than in other Hawkes Bay areas. This extra heat combined with gravely soils ensure ripe full flavoured grapes. Mills Reef Winery is one of New Zealand’s leading Gimblett Gravels producers, having won over 650 medals and 29 trophies in national and international competitions, along with being twice recipient of the prestigious New Zealand Winemaker of the Year Award. GIMBLETT GRAVELS WINE GROWING DISTRICT is continually producing New Zealand’s top Syrah and Bordeaux varietals.